NVCC captain Bernie Peacock would have done things differently if he had his time again in the recent close game between NVCC and Sacramento CC (SCC) at Davis cricket ground. Peacock’s sporting decision to bowl softer balls to the 11 year old son of one of the Sacramento team would end up being the difference between the teams score wise. Peacock also wasn’t helped by a batting collapse by the NVCC tail-enders with victory within touching distance. Hardeep Takhar of NVCC pictured bowling during his three wicket spell against SCC. The opposition in this game were new to NVCC so there was little knowledge of their capabilities amongst the NVCC team. The NVCC’s opponents play in the Sacramento Area League, and use the Arroyo Park ground of Davis CC as their “home ground.” Captain Peacock set out his stall early having won the toss by putting SCC into bat. An early wicket for Moe Maqsood, who in partnership with Peacock bowled a tight opening spell, after 2.4 overs set the tone for NVCC early on. Wickets fell regularly during the SCC innings and at drinks (17 overs) they stood for 105 for the loss of six wickets. Anchoring the SCC innings was their young left-handed captain Kavindu whose 53 runs off 48 balls was the bedrock of the SCC innings. With the exception of the SCC opener Jayalath who scored 25 off 30 NVCC restricted the batsmen to scores that barely broke double figures. Wickets were shared amongst the NVVCC bowling attack with both Hardeep Takhar (3 wickets for 25 runs off 5 overs) and Andrew Healy (3 for 24 off 4.1) finding success with their slow-medium pace on a relatively unpredictable pitch. This pair were supported by Maqsood (2 for 18 off 5) and Sushil Kumar (2 for 8 off 2) in addition to some excellent fielding a stunning catch from American Jared Thatcher playing his first game for NVCC after a long layoff. 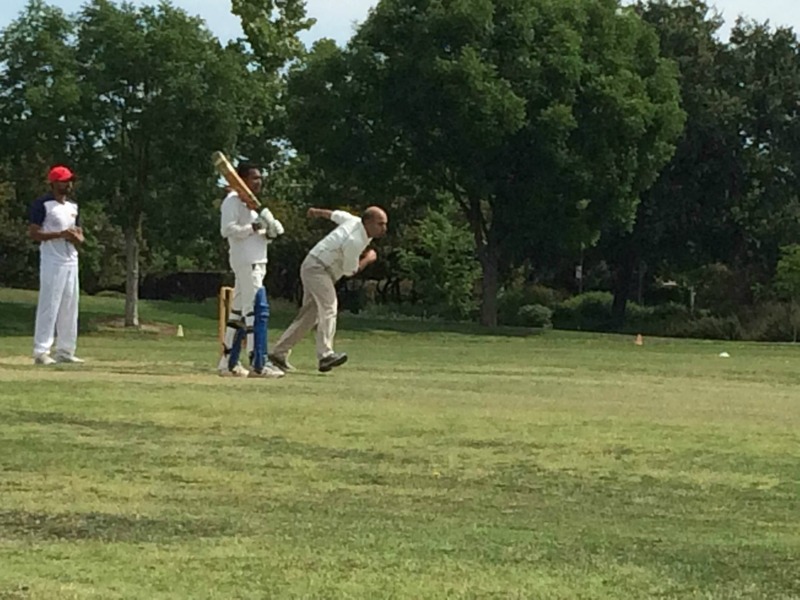 NVCC’s Martin Mackenzie (with bat at far end) opening the batting for NVCC against SCC in Davis recently. opened with Martin Mackenzie and Maqsood and the pair started strongly with 35 on the board by the 10th over when Maqsood fell. Mackenzie was joined by the big-hitting Kumar who despite struggling with the ball onto his bat top scored for NVCC with 32 runs from the 26 balls that he faced. Mackenzie departed for a very credible 18 off 45 balls and Australian Leigh Richie (13 off 24) joined Kumar in the middle. Richie anchored the next few batsmen as wickets fell with NVCC making steady progress towards their target. American Peter Cameron took a particular liking to any of the SCC bowling that sat up and he smashed a six well past the boundary. The see-saw nature of the chase continued with both Cameron (21 off 21) and Phil Bourke (14 off 21) falling in the 28th over to the bowling of Prasanna as they both looked well set. A late innings flurry from Surynash Kumar (15 off 12) pushed NVCC to 151 and within sight of victory. It wasn’t to be as NVCC capitulated with only eight runs needed as they lost their last three wickets for the addition of only one run. 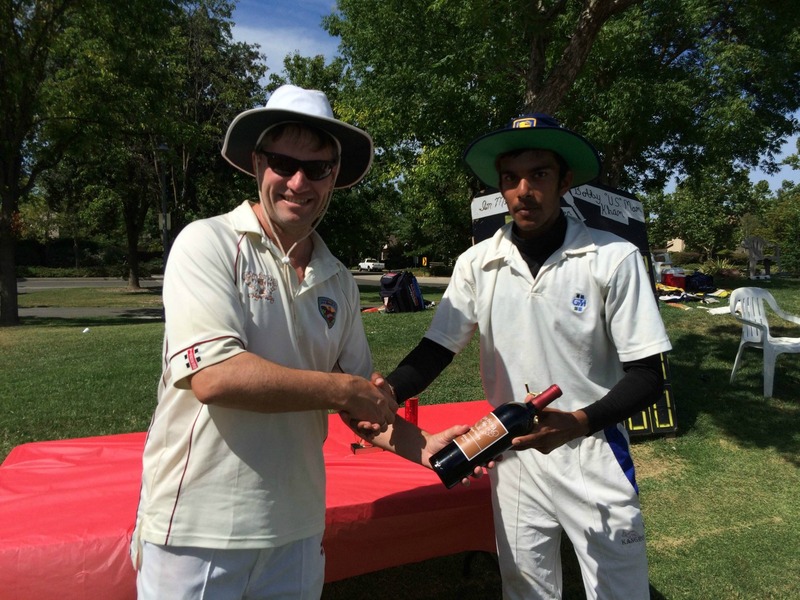 After the match, captain Peacock presented the Clos du Val Man of the Match award to SCC’s Kavindu for his 53 with the bat and his efforts in organizing the first game between the two clubs. SCC will visit Calistoga in a return game on Sunday 30th August. Napa Valley CC Batting – Sushil Kumar 32 off 26 balls (2 x 4, 2 x 6), Peter Cameron 21 off 21 (2 x 4, 1 x 6), Martin Mackenzie 18 off 45 (1 x 4). 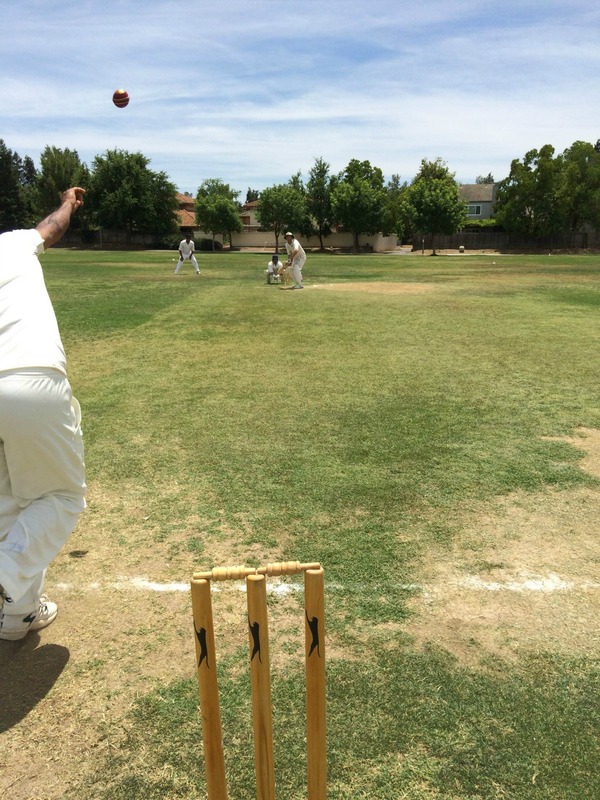 Napa Valley CC Bowling – Hardeep Takhar 3 wickets for 25 runs off 5 overs, Andrew Healy 3 for 24 off 4.1, Moe Maqsood 2 for 18 off 5.